Do you want to order Jeanne with or without a face-up? Jeanne is an original sculpt by Depths Dolls for PNW BJD Expo 2019. Deposits are non-refundable. The balance must be paid by February 28, 2019. 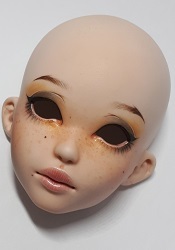 Your doll will be shipped by mid-May 2019, your price includes shipping.